Platinum End Unit! April 15-19 Open! Booking For Summer! 'Simply The Best' the Regency has to offer! Beautiful East End Unit! You can see all the way to Destin from this 4th floor East End Unit at the Navarre Beach Regency. Unit 401 Regency is a Platinum unit and has everything you need to have the perfect vacation on Navarre Beach. We are just waiting on YOU! Unit 401 is not a typical rental unit! We sit right on the Gulf and there is nothing between you and the Gulf but pristine sand! Please note: our weeks run Sat. to Sat. during the summer season. I have multiple units at the Regency and on Navarre Beach ~ love to look for other units at the Regency or other locations for you if unit 401 Regency is not available. You may reserve for less than a week at certain times but check in or check out must be on Saturday. We require half the total due within 7 days of booking and the balance is due 30 days before check in. There is a refundable $250.00 damage deposit required with a signed Rental Agreement. I look forward to helping you plan a great vacation on Navarre Beach. Unit 401 has spectacular views of the Gulf from the living space and master bedroom which both open to a 30 x 8 private balcony. You will also enjoy the 3 extra views from the East end windows. High definition tv's, upgraded appliances, countertops, linens, carpet, etc. are found throughout unit 401. Enjoy the lifestyle of relaxed island living for a week, a month, or just a few days! Our spectacular 4th floor condo is waiting to be called home by your family! We appreciate your choice to spend your valuable vacation time and money with us and know that our condo will exceed your expectations! Our oversized pool is heated to 82 degrees from March until the end of October. We also have a well equipped fitness center on the first floor. Love to help you book the perfect getaway to Navarre Beach! COME AND ENJOY THE LONGEST FISHING PIER FLORIDA! Navarre Beach offers dazzling white beaches bordered by the emerald blue waters of the Gulf of Mexico on one side, and just a few steps in the other direction, you will find the calm waters of the Santa Rosa Sound, our intercoastal waterway. We have been named one of the top 25 beaches in the US for the 4th year in a row! Come and find out why! The Navarre Beach area is landscaped with crystal clear streams, bays and rivers throughout the county so there is a lot more to offer than just the Gulf. It also offers a seashore trail, multipurpose trail, abundant wildlife, and much more! Whether you are seeking a quiet, relaxing afternoon by the shore or an outdoor adventure with exciting attractions for the entire family, Navarre Beach provides plenty of activities to keep everyone busy. Ecotourism abounds, with ample opportunities for kayaking, surfing, boating, snorkeling, hiking, bird watching, fishing and much more! We have given great attention to detail throughout our condo and our guests notice the little 'extras' we provide. 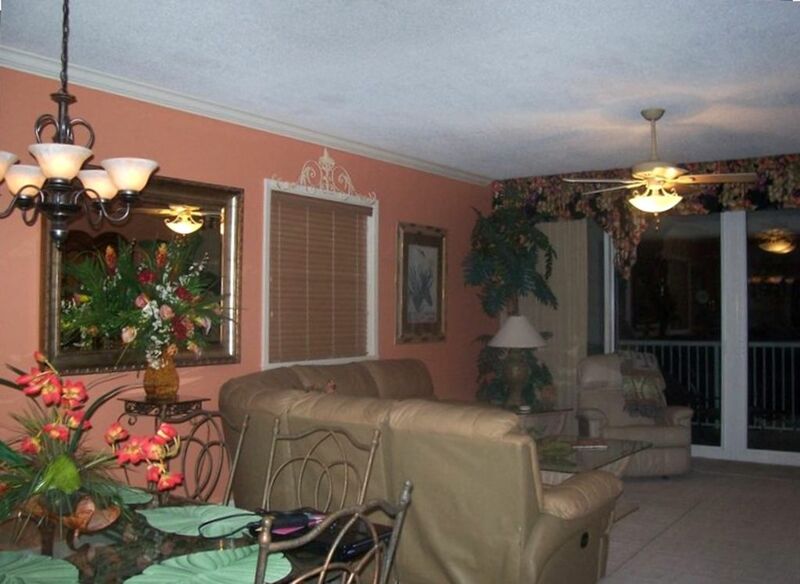 Our unit was professionally decorated and it is upscale, tropical and relaxing - platinum plus in its furnishings! We have a sectional sofa which contains a queen sofa bed. Enjoy your favorite sporting events on our 44' High Def TV. Our kitchen is updated and fully equipped. It is very well appointed and whether you want to cook a little or a lot you'll have what you need! Our laundry room is spacious with full sized washer and dryer for your convenience. Unit 401 is spacious with over 1500 square feet of space and you will have all the conveniences of home. The master bedroom had a very comfortable king sized bed, reclining chair and the master bath has a whirlpool tub/shower combination. The spacious second bedroom has 2 queen beds with an adjoining bathroom. This arrangement is perfect for 2 couples or families wanting to travel together. We continually update our 'home away from home' and our guests are never dissappointed! The Regency is a wonderful complex on Navarre Beach. Regency condos have nine foot ceilings, floor to ceiling sliding glass doors in both the great room and the master suite overlooking the water. The balcony is very comfortably furnished for your relaxation and enjoyment. On Navarre Beach you'll enjoy a tropical paradise found no where else in the Panhandle of Florida. We enjoy a quiet beauty on the island where you can truly sit back, relax, and take it all in. The three miles of developed beach that make up Navarre Beach are spectacular! Both East and West of the area are miles and miles of protected beaches that are often secluded. On our West end you can enjoy 1 of only 10 National Seashores in the US. DON'T MISS THIS DRIVE AT SUNSET! Enjoy lots of sea life, sea turtles, porpoises playing in the ocean and viewed from your balcony. Santa Rosa Sound is also found in our back yard. Great for boating, wave runners, fishing. Beauty unsurpassed! Our motto for the perfect trip to Navarre is Relax, Relax, Relax! Our condo is a No Smoking, No Pet unit. Minimum Rental Age is 25. We usually require a 3 night rental period but exceptions can be made. Our weeks normally run Sat to Sat. Email any questions or concerns - we would love to have you join us! **I have 3 units on the same floor! If this one is not open I will find you one that is!! Bring friends and family on vaction with you! We just celebrated our 45th anniversary! We celebrated at the Alabama National Championship win! We are the proud grandparents of Luke and Andrew Evans and they are almost 7! They throughly enjoy their beach trips! The beach is the perfect place to spend with our family and friends. We just relax and enjoy all the beauty that God has surrounded us with! What a perfect time to reconnect with those that we love or just enjoy the spectacular beauty of Navarre Beach! We have always dreamed of owning a place on the beach and Navarre Beach and the Regency was the perfect place! It is a midrise complex with a wonderful family atmosphere! We love the lifestyle of Navarre Beach. We can feel our blood pressure go down and lifes worries leave as we go across the bridge and onto the island. Every season is the perfect season to be there! We have wonderful large, private balconies at the Regency. We have over 400 feet of beach frontage and because of the low density of our complex it is never crowded. We enjoy a 'family atmosphere' at the Regency and on Navarre Beach. We have ample parking and if you request ahead of time you can bring your boat, etc. Our oversized pool is never crowded and we love it in during cooler weather when its heated. It's just a wonderful place to call 'home' even if just for a few days! Sits right on the beach! Phone with long distance capability at no charge. Linens are provided but you must bring your own beach towels for pool or beach. Fitness Center on Site, No steps to get into condos or from condos to the pool or beach. Outside storage area for chairs and pool toys. Naval Air Museum, IMAX theater, Flea Market, Gulfarium, Zoo and much more - 20 miles from Destin and Pensacola Shopping!